Game On! 2016 is a celebration of gaming. Computer gaming. For those kids who love computer games, and there are many of them, this will be a book that will be pored over and well used for some time. “All the best games. Amazing facts. 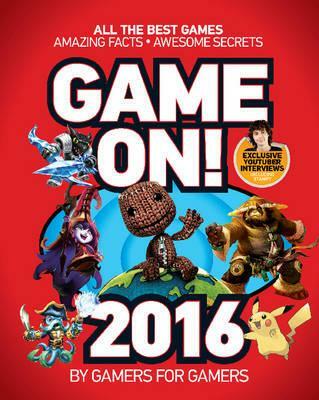 Awesome secrets.” That’s how it is described on the cover, and Game On! is certainly packed full of information, pulled together “by gamers for gamers.” Their credits include years contributing to gaming magazines, participating in gaming conventions, and of course playing games. The book itself is divided into many different categories, like the games themselves, gaming secrets, lists of cutest characters, weirdest games, gaming hoaxes and more, plus roundups of the best indie games, gaming jargon, and so on. Gamers will love the hundreds of screenshots, gaming tips, and almost endless trivia packed into the pages of Game On!. Fewer than ten people have ever achieved the highest possible score in the arcade version of Pac-Man (that score is 3,333,360). Star Wars: Rogue Squadron was released six months before the new Star Wars movie, but there is a code that will unlock it to reveal a ship that first appears in the new movie.